With country music songwriters coming to town this weekend for the sixth annual New England to Nashville Martha’s Vineyard Songwriters’ Festival, we’ve been thinking about all the ways the Island could be the subject of a country music hit: “On the Island Again,” “I Hope You Dance (at the Ritz),” “The Devil Went Down to Menemsha,” “Your Cheatin’ Chilmark Heart.” Okay, we’d better leave the songwriting to the pros; but we are excited about the event, especially the songwriting workshop on Saturday and the “Behind the Curtains” show at the Strand on Saturday night featuring songwriters telling backstories and rising stars singing a few tunes. The rising stars will also perform on Circuit Avenue on Saturday afternoon. If you’re not (yet) a country music convert, don’t worry, your musical options are still plenty for the weekend. Sunday night at the Tisbury Water Works, internationally acclaimed jazz musician Stan Strickland will perform a solo composition, Seeking Stillness Through the Roots of Afro-Asian Jazz & Blues at 6:30 p.m. Some serious talent — Rosie’s Ritzy Revue — will be on stage at the Ritz Saturday night at 7 p.m. And there’s opera on film at the Edgartown Library on Sunday at 1 p.m. 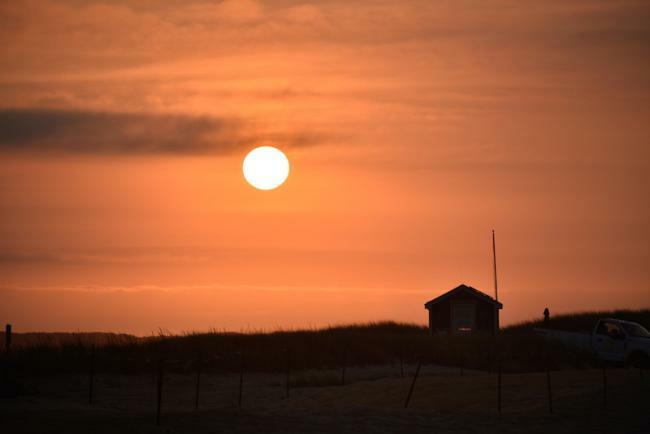 Even if you don’t make it to a show, all you really need is a September sunrise on South Beach (like the one above) and you’ll be singing, “I will always love you,” to our treasured Island. If you haven’t seen the amazing pen and ink drawings done by Island artist Jack Ryan, be sure to get to his latest show at the Vineyard Haven Public Library. Visit today between 1 p.m and 5 p.m.
Public ice skating is back; head to the MV Ice Arena today from 2:30 to 3:30 p.m.
Before it fills up, we’re going to reserve a spot in “Our Island’s Geology,” a cool Ace MV course being taught by principal earth scientist Doug Cooper. The course begins with a two-hour intro tonight and winds up with a field trip tomorrow morning. We’re also excited about the launch of local builder and sailor Gary Maynard’s first novel, Plumbelly. It’s a coming-of-age story set in the remote Pacific. Head to Bunch of Grapes bookstore at 7:00 p.m. tonight for a talk and signing. It’s Tivoli Day! Head to Oak Bluffs with the kids for this fun annual end-of-summer street festival which runs from 10 a.m. to 6 p.m. The MV NAACP George V. Tankard Jr. Memorial 5K & Fun Run takes off from the Summercamp hotel this morning at 10:30 a.m. Watch the finish and then grab some barbecue for lunch at Sea Smoke restaurant, which has just added lunch service this fall. The FARM Institute is bringing back farm dinners this fall, so tonight at 5:30 you can head to Katama for some family-friendly fun. Pre-registration is encouraged. You can find us at the MV Film Center tonight for a 7:30 p.m. screening of The Wife, starring Glenn Close and Jonathan Pryce. 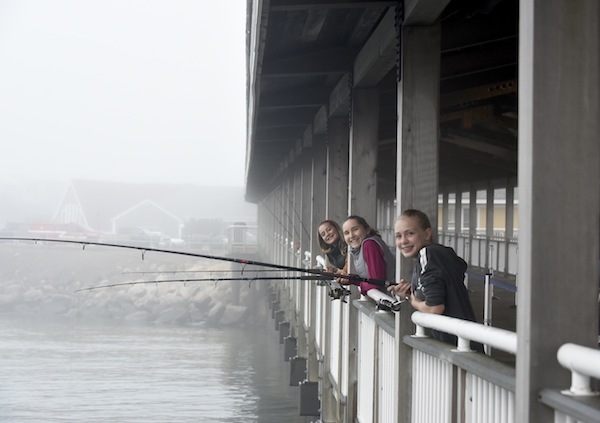 At 6 a.m. this morning, little fishermen and fisherwomen will be gathering at the Oak Bluffs Ferry Wharf for the annual Kid’s Derby, rain or shine. At 8 a.m., the 8th Annual Golf Classic benefiting Hospice of Martha’s Vineyard will get going at Mink Meadows Golf Club. And another 5K run (and walk) — this one to benefit the Vineyard Haven Public Library — sets off for West Chop at 9:45 a.m.
Islanders will want to stop by the Cardboard Box from 10 a.m. to 2 p.m. for the fundraiser for Islander Eric Voshell, who was critically injured in a motorcyle accident. You can stop by the Oak Bluffs Open Market afterwards, or hop in the car and head up-Island to the Vineyard Artisans Festival at the Grange Hall. Tonight we’re catching another new movie — this one the surprising documentary about three identical brothers separated at birth and reunited later. Three Identical Strangers screens at 7:30 p.m.
Save the Date: On Friday, September 21 join chef Molly Levine for an on-site, field-to-table, four-course, wine & entertainment harvest celebration at North Tabor Farm. For more information, click here.